On Wednesday there is the monthly report of OPEC, at times when the stock, at $ 44.57 after the brief rise at the beginning of the month, has been falling to new supports, making the Energy XLE sector remain the lowest of 2017, with - 15% YTD. The truth is that while on the one hand no one trusts OPEC and its output cuts, as I said months ago, on the other hand, production in the US also rises again: number of rigs and inventories upwards. In other words, none of them fulfills anything ... so, difficult the crude rebound as expected. And if the report is not favorable, the decline can be serious. If this happens, shortly it would enter shortly the etf USO that follows it, watching the support at $ 42.50. The other option is the etf 3X UCO, for lovers of higher risk-reward. being under the 3 SMA averages and the imminent crossing in the MACD. Early Friday, three of the 'Big Four' Wells Fargo WFC, JP Morgan JPM and Citi C, open the fires of this season. 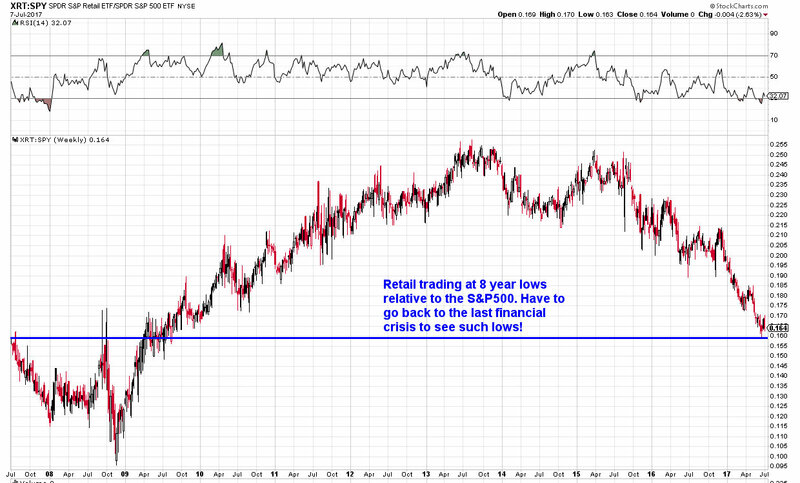 I am interested in the latter, it is good (15% YTD) recovering its pre-crisis levels of 2008. I will always say that I prefer to wait for the result of earnings and then trade according to it. The other is gambling, valid if one accepts a high risk-reward. With the retail sector XRT in crisis (today -2.34%), on Friday comes its monthly report, in which another bad result (a consensus of 0.1% is expected compared to the previous -0.3%) could be catastrophic. It is already at levels it had during the crisis of 2008. Yesterday, another iconic brand such as Abercrombie & Fitch ANF sank -21% pulling giants like Macy M -7%, WalMart WMT -2.8% BestBuy BBY -6.91% among others . In a previous post I recommended going short in XRT, because I do not see any improvement in the medium term. Amazon, one of the culprits of its crisis, even reinforces its policy with its next Geek Squad service. Goodbye to the Rate Hikes in 2017? The Apocalypse of the Retail sector?